We had a very lucky start to the day. Our flight from San Francisco was out of Oakland Airport. Despite being nearer than the main SF International airport, it takes longer to get there and requires a trip over the Bay Bridge. I had told the shuttle company that we wanted to be there for 9am. This meant a 7:50 pick-up, just in case we hit jams. We hit no jams, though, and got there so early that the check-in staff managed to get us on a standby for the 9 o'clock flight. Given that the 10:30 flight was an hour delayed, we had saved two and a half hours already - result! Flying in to Los Angeles is an incredible experience - after San Francisco's concentrated blocks (largely walkable, if somewhat steep), LA looked gigantic. And it is - 462 square miles of it. As we flew in, I looked out for, and saw, the famous Hollywood sign. Boy did it look small. Boy were we gonna have fun getting around over the next few days, I thought to myself. I understood immediately why the car is king in LA and why travel writer Bill Bryson got the most peculiar looks for wanting to 'walk places' rather than drive. It really is a car-driver's city. Our hotel was a good 35-minute drive from LAX and fantastically placed. The Liberty on Orchid sits right behind the Kodak Theatre (where the Oscars are now held) and the most famous movie theatre of them all, Mann's Chinese Theatre. 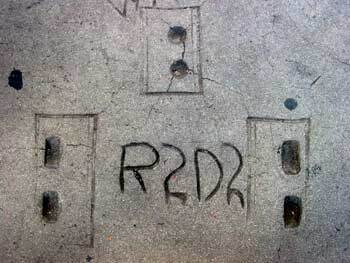 Both of these, and Hollywood Boulevard, were within a 2-minute walk. What the room lacked in creature comforts (cold tiles, drafty windows) it made up for in location. Our first stop was Mann's Chinese Theatre, the place for movie premieres and most famous for its amazing art deco finish and the stars' signatures, handprints and footprints in concrete out front. We spent some time looking at all the names, working out which ones were current, who had died long ago and so on. One thing is for sure: the stars of days gone by made more of an effort with their signatures; Tom Cruise and Tom Hanks come across like a couple of pre-schoolers compared to the flourishing signatures of the stars of the 40s and 50s. 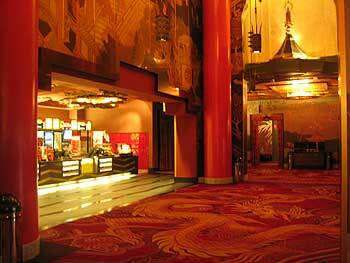 We also took a mini tour inside the theatre - a $1 charity donation (the full tour costs $8). 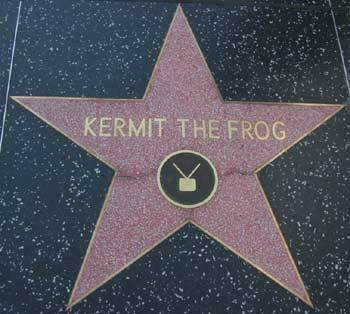 After Mann's we walked down Hollywood Boulevard, following the stars that constitute the Hollywood Walk Of Fame. Some names are instantly reconisable, others are less easy to recall, while others are complete mysteries. I, for one, found myself saying out loud "dead ...dead ... long-time dead ... dunno who that is" and so on. What happens when stars have been dead and largely forgotten? Do they get up-rooted and re-set in another location further away? What happens when a star is out of favour? Michael Jackson was still the #1 star on the map we were referring to, but on the same day the TV screens on the corner of Highland and Hollywood were publicising a show at 7pm about Jackson's parents defending him against the accusations of fiddling with kiddies, again. 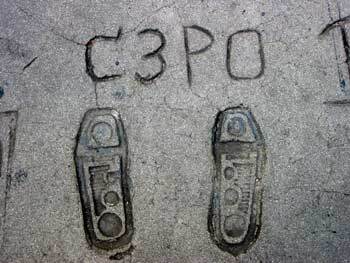 Perhaps the strangest thing about these stars embedded in the pavement (or should I say sidewalk?) is that they are not exclusively movie stars' names. Stars of TV shows, and musical greats line the streets, and as for movies, it's just as much the people working behind the cameras (directors, editors etc) as the actors in front of the cameras who are honoured here. But how do you justify fictional characters like Kermit the Frog, I ask you? Or the Rugrats? Yes, you read that right. Already they've been honoured and they're not even out of diapers. 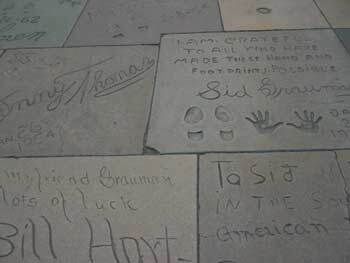 Having taken time out to eat, make a diversion to withdraw some cash and other time-wasting browsing around the local shops, we walked back up Hollywood Boulevard on the opposite side spotting more stars names on the floor. Next up - a visit to the Hollywood Wax Museum (think Madame Taussauds only with really bad lookalikes - Kate Winslet's Titanic model looked more like a younger but fatter Melanie Griffith) and the Guinness Book of Records which had nothing to do with Hollywood at all. Apart from it being in Hollywood, obviously. 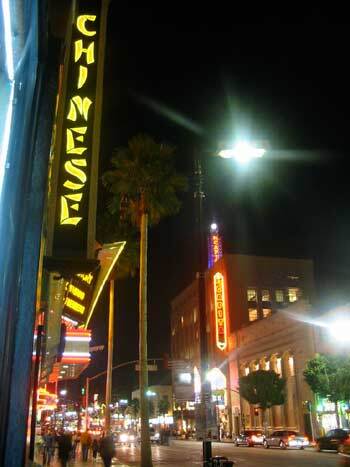 Mann's Chinese Theatre sign at night, looking down Hollywood Boulevard. An early night? Heck no! A night in the hotel room with some bottles of bud and a mission to recharge all the camera, camcorder, walkabout, PDA and laptop batteries before we hit the more electricity-shy Fiji. Did I mention that I was a gadget geek? It's Universal - This is Great!